Helicobacter pylori infection which is recognized as carcinogen by WHO is a major public health problem in both developing and developed countries with high prevalence. It is well known that H. pylori causes mainly to chronic gastritis colonising in the gastric mucosa. Gastric microbiota is important in the occurrence and development of diseases caused by H. pylori. Nutritional modification providing a reduction in the population of H. pylori at the gastric mucosa will help to decrease the risk of H. pylori-associated diseases including peptic ulcer, chronic gastritis, gastric adenocarcinoma, mucosa associated lymphoid tissue lymphoma and duodenal ulcer disease. Antibiotic therapy is applied in this infection, but meanwhile it’s side effects and antibiotic resistance be seen. Studies indicate that probiotics which have positive effects on intestinal microbiota increase eradication rates of H. pylori, improve patient clinical symptoms and improve patient compliance by reducing side effects associated with antibiotic treatment. Dünya Sağlık Örgütü tarafından kanserojen grupta sınıflandırılan Helicobacter pylori enfeksiyonu yüksek tekrarlanma sıklığı ile hem gelişmekte olan hem de gelişmiş ülkelerde görülen önemli bir halk sağlığı sorunudur. H. pylori'nin mide mukozasında kolonize olarak kronik gastritin ana nedenini oluşturduğu bilinmektedir. Mide mikrobiyotası H. pylori’nin sebep olduğu hastalıkların oluşmasında ve gelişmesinde önemli bir rol oynamaktadır. Beslenme düzenindeki değişimlerle gastrik mukozadaki H. pylori yoğunluğunda azalma sağlanması, H. pylori ile ilişkili peptik ülser, kronik gastrit, mide adenokarsinoması, mukoza ile ilişkili lenfoid doku lenfoması ve duodenal ülser hastalığı gibi hastalıkların ortaya çıkma riskini azaltmaya yardımcı olacaktır. H. pylori enfeksiyonunda antibiyotik tedavisi uygulanmakta, fakat bu süreçte antibiyotik direnci ve antibiyotik tedavisinin yan etkileri görülebilmektedir. Yapılan çalışmalar bağırsak mikrobiyotası üzerinde olumlu etkiye sahip olan probiyotiklerin; H. pylori enfeksiyonu tedavisinde eradikasyon oranını arttırdığını, hasta klinik belirtilerini iyileştirdiğini ve tedaviye bağlı antibiyotik ile ilişkili yan etkileri azaltarak hasta uyumunu arttırdığını belirtmektedir. Ahmad, K., Fatemeh, F., Mehri, N., Maryam, S. (2013). Probiotics for the Treatment of Pediatric Helicobacter pylori Infection: A Randomized Double Blind Clinical Trial. Iran J Pediatr, 23(1): 79-84. Aiba, Y., Nakano, Y., Koga, Y., Takahashi, K., Komatsu, Y. (2015). A highly acid-resistant novel strain of Lactobacillus jonsenii No.1088 has antibacterial activity, including that against Helicobacter pylori, and inhibited gastrin-mediated acid production in mice. Microbiologyopen, 4:465-474. Akalın, A.S., Erişir, D. (2008). Effects of Inulin and Oligofructose on the Rheological Characteristics and Probiotic Culture Survival in Low-Fat Probiotic Ice Cream. 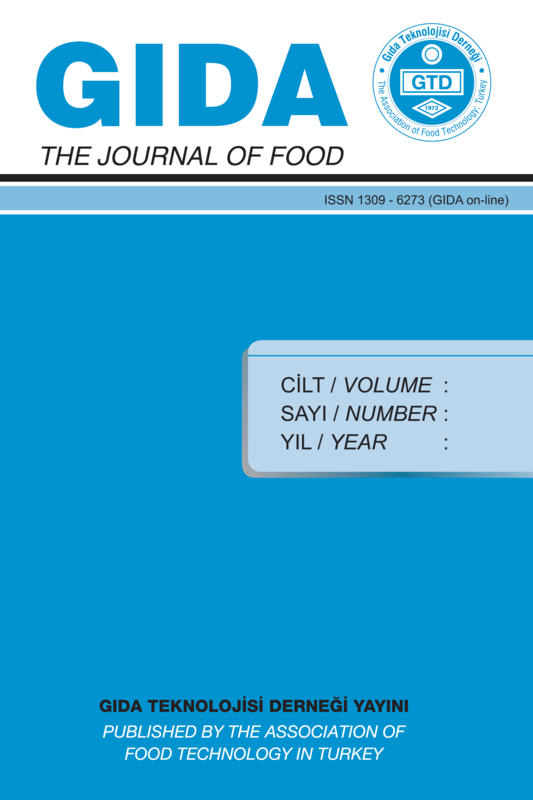 J Food Sci, 73(4): 184-188, doi:10.1111/j.1750-3841.2008.00728.x. Akalın, A.S., Unal, G. (2005). Probiyotikler ve Allerji. GIDA, 30(1): 43-48. Alvi, S., Javeed, A., Akhtar, B., Sharif, A., Akhtar, M.F. (2017). Probiotics for cure of Helicobacter pylori infection: A review. Int J Food Prop, 20(10): 2215–2222, doi: 10.1080/10942912.2016.1233432. Apostolidis, E., Kwon, Y.I., Shinde, R. Ghaedian, R., Shetty, K. (2011). Inhibition of Helicobacter pylori by fermented milk and soymilk using select lactic acid bacteria and link to enrichment of lactic acid and phenolic content. Food Biotechnol, 25:58–76, doi:10.1080/08905436.2011.547118. Bortoli N, Leonardi G, Ciancia E, Merlo, A., Bellini, M., Costa, F., Mumolo, M.G., Ricchiuti, A., Cristiani, F., Santi, S., Rossi, M., Marchi, S. (2007). Helicobacter pylori eradication: A randomized prospective study of triple therapy versus triple therapy plus lactoferrin and probiotics. Am J Gastroenterol, 102: 951–956, doi:10.1111/j.1572-0241.2007.01085.x. Canducci, F., Armuzzi, A., Cremonini, F., Cammarota, G., Bartolozzi, F., Pola, P., Gasbarrini, G., Gasbarrini, A. (2000). A lyophilized and inactivated culture of Lactobacillus acidophilus increases Helicobacter pylori eradication rates. Aliment Pharmacol Ther, 47(7): 1625-1629. Cats, A., Kuipers, E. J., Bosschaert, M. A. R., Pot, R. G. J., Vandenbrouckegrauls, C. M. J. E., Kusters, J. G. (2003). Effect of frequent consumption of a Lactobacillus casei-containingmilk drink in Helicobacter pylori-colonized subjects. Aliment Pharmacol Ther, 17: 429–435, doi: 10.1046/j.0269-2813.2003.01452.x. Ceapa, C., Rezaïki, L., Kleerebezem, M., Knol, J., Oozeer, R. (2013). Influence of fermented milk products, prebiotics and probiotics on microbiota composition and health. Best Pract Res Clin Gastroenterol, 27: 139–155, doi:10.1016/j.bpg.2013.04.004. Chotivitayatarakorn, P., Siramolpiwat, S., Chonprasertsuk, S., Kanokwanvimol, A., Anupong Tangaroonsanti, A., Bhanthumkomol, P., Bubpha Pornthisarn, B., Mahachai, V., Vilaichone, R.K. (2017). Effectiveness of 7-Day and 14-Day Moxifloxacin-Dexlansoprazole Based Triple Therapy and Probiotic Supplement for Helicobacter Pylori Eradication in Thai Patients with Non-Ulcer Dyspepsia: A Double-Blind Randomized Placebo-Controlled Study. Gastroenterology, 152(5): 250, doi:10.1016/S0016-5085(17)31129-0. Cindoğlu, Ç., Uyanıkoğlu, A., Sert, U., Yenice, N. (2017). Helicobacter pylori eradikasyonunda ardışık 5+5 (10) günlük ve ardışık 7+7 (14) günlük tedavilerin karşılaştırılması. Akad Gastroenterol Derg, 16(3): 91-96, doi:10.17941/agd.351642. Coconnier, M.H., Lievin, V., Hemery, E., Servin, A.L. (1998). Antagonistic Activity against Helicobacter Infection In Vitro and In Vivo by the Human Lactobacillus acidophilus Strain LB. Appl Environ Microbiol, 64(11): 4573–4580. Çekin, A.H., Şahintürk, Y., Harmandar, F.A., Uyar, S., Yolcular, B.O., Çekin, Y. (2017). Use of probiotics as an adjuvant to sequential H. pylori eradication therapy: impact on eradication rates, treatment resistance, treatment-related side effects, and patient compliance. Turk J Gastroenterol, 28: 3-11. Dang, Y., Reinhardt, J.D., Zhou, X., Zhang, G. (2014). The Effect of Probiotics Supplementation on Helicobacter pylori Eradication Rates and Side Effects during Eradication Therapy: A Meta-Analysis. Plos One, 9(11): 111030, doi: 10.1371/journal.pone.0111030. Domingo, J.J.S. (2017). Review of the role of probiotics in gastrointestinal diseases in adults. Gastroenterol Hepatol, 40(6): 417-429. Dore, M.P., Goni, E., Di Mario, F. (2015). Is There a Role for Probiotics in Helicobacter pylori Therapy?. Gastroenterol Clin N Am, 44: 565–575, doi:10.1016/j.gtc.2015.05.005. Emara, M.H., Elhawari, S.A., Yousef, S. Radwan, M.I., Abdel-Aziz, H.R. (2016). Emerging Role of Probiotics in the Management of Helicobacter Pylori Infection: Histopathologic Perspectives. Helicobacter, 21: 3–10, doi: 10.1111/hel.12237. Fahey, J.W., Stephenson, K.K., Wallace, A.J. (2015). Dietary amelioration of Helicobacter infection. Nutr Res, 35: 461-473, doi:10.1016/j.nutres.2015.03.001. FAO/WHO (2001). Report on Joint FAO/WHO Expert Consultation on Evaluation of Health and Nutritional Properties of Probiotics in Food Including Powder Milk with Live Lactic Acid Bacteria. FAO/WHO Report No. 10-1-2001, Cordoba, Argentina. Felley, C., Michetti, P. (2003). Probiotics and Helicobacter pylori. Best Pract Res Clin Gastroenterol, 17(5): 785–791, doi:10.1016/S1521-6918(03)00070-2. Feng, J.R., Wang, F., Qiu, X., McFarland, L.V., Chen, P.F., Zhou, R., Liu, J., Zhao, Q., Li, J. (2017). Efficacy and safety of probiotic-supplemented triple therapy for eradication of Helicobacter pylori in children: a systematic review and network meta-analysis. Eur J Clin Pharmacol, 73: 1199–1208, doi:10.1007/s00228-017-2291-6. Grgov, S., Tasic, T., Radovanovic-Dinic, B. , Benedeto-Stojanov, D. (2016). Can probiotics improve efficiency and safety profile of triple Helicobacter pylori eradication therapy? A prospective randomized study. Vojnosanit Pregl, 73(11): 1044–1049, doi:10.2298/VSP150415127G. Haghdoost, M., Taghizadeh, S., Montazer, M., Poorshahverdi, P., Ramouz, A. and Fakour, S. (2017). Double strain probiotic effect on Helicobacter pylori infection treatment: A double-blinded randomized controlled trial. Caspian J Intern Med, 8(3): 165-171, doi:10.22088/cjim.8.3.165. Hamilton-Miller, J.M.T. (2003). The role of probiotics in the treatment and prevention of Helicobacter pylori infection, Int J Antimicrob Agents, 22: 360-366, doi:10.1016/S0924-8579(03)00153-5. Horie, K, Horie, N, Abdou, A.M., Yang, J.O., Yun, S.S., Chun, H.N., Park, C.K., Kim, M., Hatta, H. (2004). Suppressive effect of functional drinking yogurt containing specific egg yolk immunoglobulin on Helicobacter pylori in humans. J Dairy Sci, 87(12): 4073-4079. Khalil, M.A., El-Sheekh, M.M., El-Adawi, H.I., El-Deeb, N.M., Hussein, M.Z. (2015). Efficacy of microencapsulated lactic acid bacteria in Helicobater pylori eradication therapy. J Res Med Sci, 20: 950-957, doi: 10.4103/1735-1995.172782. Lee, C.Y., Shih, H.C., Yu, M.C., Lee, M.Y., Chang, Y.L., Lai, Y.Y., Lee, Y.C., Kuan, Y.H., Lin, C.C. (2017). Evaluation of the Potential Inhibitory Activity of a Combination of L. Acidophilus, L. Rhamnosus and L. Sporogenes on Helicobacter Pylori: A Randomized Double-Blind Placebo-Controlled Clinical Trial. Chin J Integr Med, 23(3): 176-182, doi:10.1007/s11655-016-2531-0. Lionetti, E., Indrio, F., Pavone, L., Borrelli, G., Cavallo, L., Francavilla, R. (2010). Role of Probiotics in Pediatric Patients with Helicobacter pylori Infection: A Comprehensive Review of the Literature. Helicobacter, 15: 79-87. Lü, M., Yu, S., Deng, J., Yan, Q., Yang, C., Xia, G., Zhou, X. (2016). Efficacy of Probiotic Supplementation Therapy for Helicobacter pylori Eradication: A Meta-Analysis of Randomized Controlled Trials. Plos One, 11(10): e0163743, doi: 10.1371/journal.pone.0163743. Mantegazzaa, C., Molinarib, P., D’Auriaa, E., Sonninoa, M., Morellib, L., Zuccottia G.V. (2018). Probiotics and antibiotic-associated diarrhea in children: A review and new evidence on Lactobacillus rhamnosus GG during and after antibiotic treatment. Pharmacol Res, 128: 63–72, doi:10.1016/j.phrs.2017.08.001. Mathipa, M.G., Thantsha, M.S. (2017). Probiotic engineering: towards development of robust probiotic strains with enhanced functional properties and for targeted control of enteric pathogens. Gut Pathog, 9:28, doi: 10.1186/s13099-017-0178-9. McFarland, L.V., Huang, Y., Wang, L., Malfertheiner, P. (2016). Systematic review and meta-analysis: Multi-strain probiotics as adjunct therapy for Helicobacter pylori eradication and prevention of adverse events. United European Gastroenterol J, 4(4): 546–561, doi:10.1177/2050640615617358. Namkin, K., Zardast, M., Fatemeh Basirinejad, F. (2016). Saccharomyces Boulardii in Helicobacter Pylori Eradication in Children: A Randomized Trial From Iran. Iran J Pediatr, 26(1): e3768, doi:10.5812/ijp.3768. Oh, B., Kim, J.W., Kim, B.S. (2016). Changes in the Functional Potential of the Gut Microbiome Following Probiotic Supplementation during Helicobacter Pylori Treatment. Helicobacter, 21: 493–503, doi:10.1111/hel.12306. Özdemir, Ö. (2015). Prebiyotikler, Probiyotikler ve Alerji. https://www.researchgate.net/profile/Oner_Ozdemir/publication/307210567_Prebiyotikler_Probiyotikler_ve_Alerji/links/57c4881a08aeb04914357df7/Prebiyotikler-Probiyotikler-ve-Alerji.pdf (Erişim tarihi: 20.04.2018). Pan, M., Wan, C., Xie, Q., Huang, R., Tao, X. Shah, N.P., Wei, H. (2016). Changes in gastric microbiota induced by Helicobacter pylori infection and preventive effects of Lactobacillus plantarum ZDY 2013 against such infection. J Dairy Sci, 99(2):970–981, doi:10.3168/jds.2015-10510. Pantoflickova, D., Corthesy-Theulaz, I., Dorta, G., Stolte, M., Isler, P., Rochat, F., Enslen, M., Blum, A. L. (2003). Lactobacillus johnsonii on Helicobacter pylori associated gastritis. Aliment Pharmacol Ther, 18: 805–813, doi:10.1046/j.0269-2813.2003.01675.x. Patel, A., Shah, N., Prajapati, J.B. (2014). Clinical application of probiotics in the treatment of Helicobacter pylori infection: A brief review. J Microbiol Immunol Infect, 47: 429-437, doi:10.1016/j.jmii.2013.03.010. Sachdeva, A., Rawat, S., Nagpal, J. (2014). Efficacy of fermented milk and whey proteins in helicobacter pylori eradication: A review. World J Gastroenterol, 20(3): 724-737, doi:10.3748/wjg.v20.i3.724. Sakamoto I., Igarashi M., Kimura K., Takagi A., Miwa T., Koga,Y., (2001). Suppressive effect of Lactobacillus gasseri OLL 2716(LG21) on Helicobacter pylori infection in humans. J Antimicrob Chemother, 47: 709–710. Schulz, C., Koch, N., Schütte, K. Pieper, D.H., Malfertheiner, P. (2015). H. pylori and its modulation of gastrointestinal microbiota. J Dig Dis, 16: 109–117, doi:10.1111/1751-2980.12233. Shahraki, T., Shahraki, M., Shahri, E.S., Mohammadi, M. (2017). No significant impact of Lactobacillus reuteri on eradication of Helicobacter pylori in children (Double blind randomized clinical trial). Iran Red Crescent Med J, 19(3):e42101, doi: 10.5812/ircmj.42101. Sykora, J., Valeckova, K., Amlerova, J., Siala, K., Dedek, P., Watkins, S., Varvarovska, J., Stozicky, F., Pazdiora, P., Schwarz, J. (2005). Effects of a specially designed fermented milk product containing probiotic Lactobacillus casei DN- 114 001 and the eradication of of H. pylori in children, A prospective randomized double-blind study. J Clin Gatroenterol, 39(8): 692-698. Vitor, J.M.B., Vale, F.F. (2011). Alternative therapies for Helicobacter pylori: probiotics and phytomedicine. FEMS Immunol Med Microbiol, 63: 153–164, doi: 10.1111/j.1574-695X.2011.00865.x. Wang, F., Feng, J., Chen, P. Liu, X., Ma, M., Zhou, R., Chang, Y., Liu, J., Li, J., Zhao, Q. (2017a). Probiotics in Helicobacter pylori eradication therapy: Systematic review and network meta-analysis. Clin Res Hepatol Gastroenterol, 41: 466—475, doi: 10.1016/j.clinre.2017.04.004. Wang, Z.J., Chen, X.F., Zhang, Z.X., Li, Y.C., Deng, J., Tu, J., Song, Z.Q., Zou, Q.H. (2017b). Effects of anti-Helicobacter pylori concomitant therapy and probiotic supplementation on the throat and gut microbiota in humans. Microb Pathog, 109: 156-161, doi:10.1016/j.micpath.2017.05.035. Wen, J. Peng, P., Chen, P., Zeng, L., Pan, Q., Weil, W., He1, J. (2017). Probiotics in 14-day triple therapy for Asian pediatric patients with Helicobacter pylori infection: a network meta-analysis. Oncotarget, 8,(56): 96409-96418. Yaşar, B., Abut, E., Kayadibi, H., Toros, B., Sezikli, M., Akkan, Z., Keskin, Ö., Övünç Kurdaş, O. (2010). Probiyotiklerin Helikobakter pilori eradikasyon tedavisindeki etkinliği. Turk J Gastroenterol, 21(3): 212-217, doi:10.4318/tjg.2010.0090. Zhu, X.Y., Liu, F. (2017). Probiotics as an adjuvant treatment in Helicobacter pylori eradication therapy. J Dig Dis, 18: 195–202, doi:10.1111/1751-2980.12466.